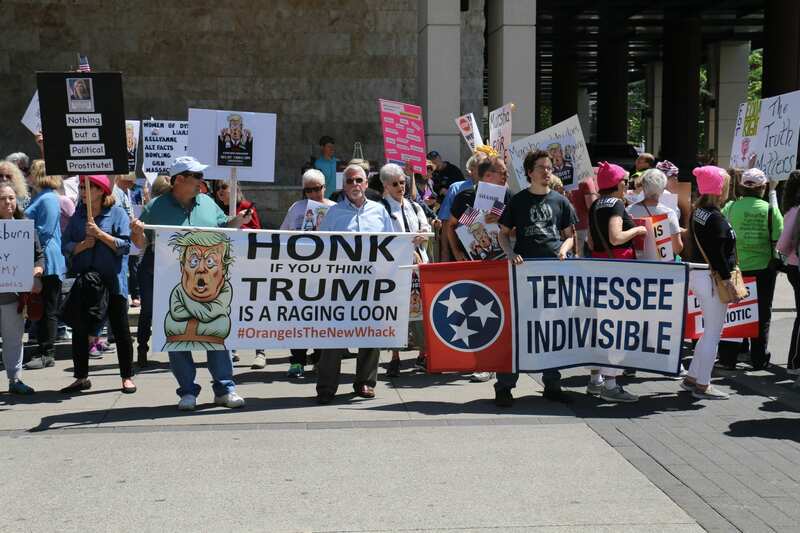 NASHVILLE, TN – About 250 Middle Tennessee Indivisibles rallied at the foot of Broadway on Monday, May 9. 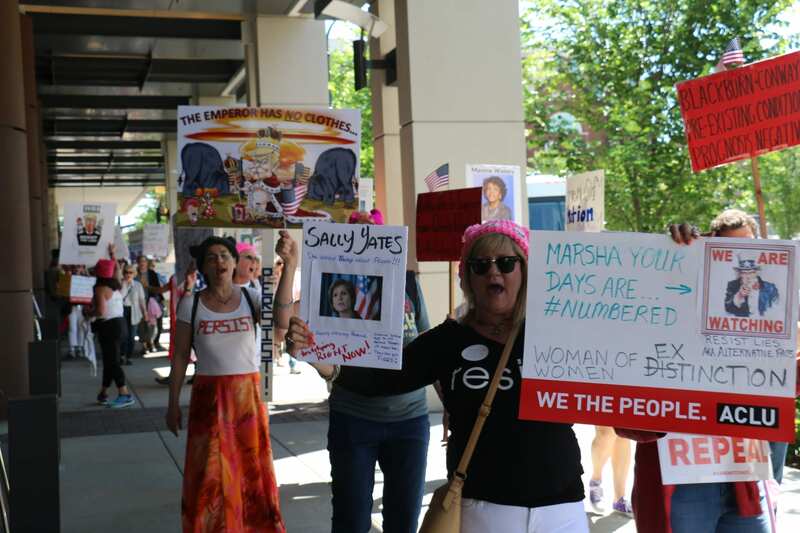 They marched eight blocks to the Omni Hotel where Rep. Marsha Blackburn (R-TN 7th District) and Kellyanne Conway were attending a luncheon to honor “Women of Distinction”. Blackburn represents nearby Williamson County and is being publicly shamed by a billboard on I-65 calling her a tool of the Telecom industry. Blackburn sponsored a bill that takes away privacy Internet rules. President Trump signed the bill last week. Conway, a coined the term “alternative facts” referring to White House lies and has been embroiled in a number of controversies as a senior adviser to the President. Last week Saturday Night Live spoofed Conway as Carmen Santiago, who cannot be found, like the 1990’s children’s TV show. Conway has been noticeably absent from the media spotlight after being challenged on air by MSNBC and CNN. By her appearance in Nashville, Conway has reemerged although the luncheon was private and the media was not allowed in. May 1, called May Day and International Workers’ Day, was celebrated around the world and in numerous American cities where tens of thousands of demonstrators protested President Trump’s first 100 days in office. Most of those protests were peaceful like the Nashville demonstration Monday morning. Police were on hand and the only disruption came from two low-riders who revved up their motorcycle engines to a deafening pitch several times during the protest. Demonstrators countered with chants of “Show me what democracy sounds like” and “Hey Hey, Ho Ho, Marsha Blackburn has got to go” There were no arrests. Most of the protestors were women, who are dismayed by Trump’s actions and who consider Blackburn’s policy positions “anti-women”. 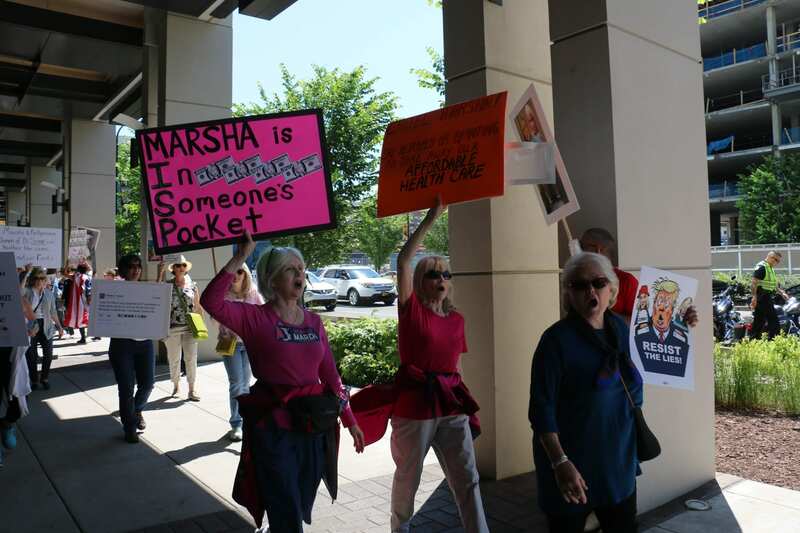 They carried signs saying things like “Kill This Health Bill Before It Kills Us”, “Honk if You Think Trump is a Raging Loon”, and “Marsha is In Someone’s Pocket”. The Tribune interviewed Freda Player, Political Director, SEIU Local 205, on Monday, May 8. 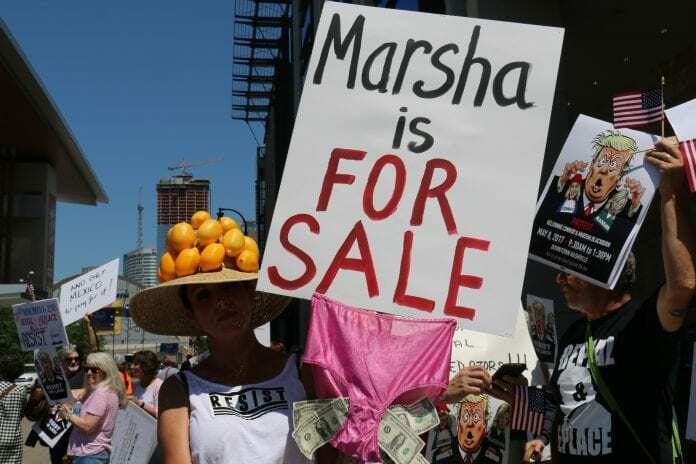 Player spoke at the demonstration against Marsh Blackburn. We asked her about the Affordable Care Act (ACA). Last week the House voted to repeal and replace the ACA on and Republicans in the Senate are now working on their own version of a national healthcare bill to replace the ACA, also known as Obamacare. 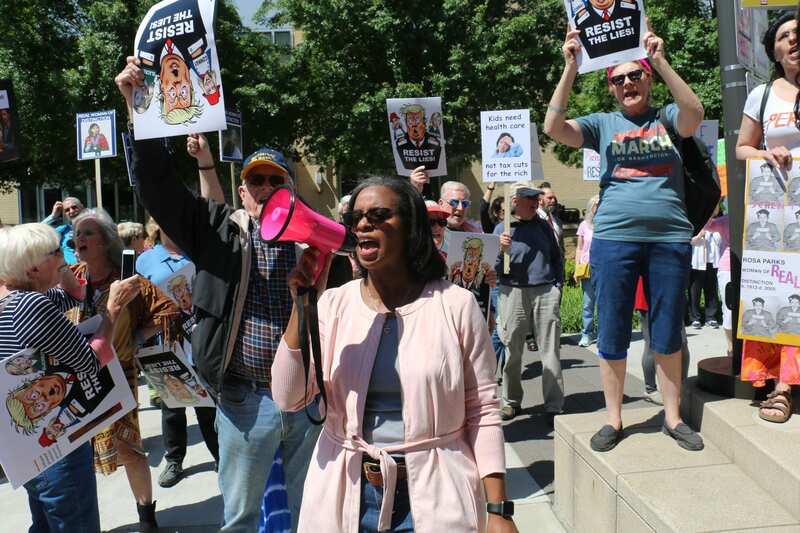 Why is your union involved with this protest against Marsha Blackburn? 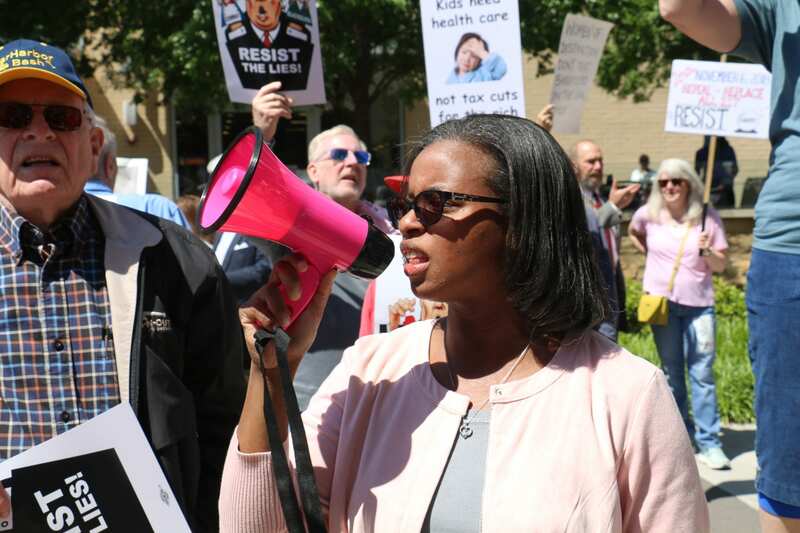 “Our union is involved because we represent a lot of working class families who depend on the Affordable Care Act (ACA), to make sure the essential benefits are enforced and protected. We also represent healthcare workers and a lot of their patients are on the ACA. Signature Long Term Care, formerly known as Bordeaux Hospital and we represent Knowles Home . 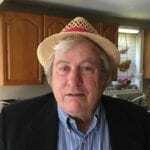 A lot of patients are on ACA or Medicaid or Medicare. What is your best hope? “We have two approaches: our first approach is to stop the repeal in the Senate. That’s our immediate approach. You know we have some good moderate Republicans. We want to pressure our own Republicans like Lamar Alexander to make sure he votes the right way, to make sure we stop the repeal in the Senate which we can. Is it just your local or the International that is taking this approach? “I think it’s possible. For example, I’m vice-chair of Emerge where we’re training women to run for office. So in the 2018 and 2020 cycles we can take over the House and Senate and we can have women there who understand what policy healthcare is. People understand the value of ACA, the essential benefits of the ACA like eliminating life time caps, making sure physicals are paid for, particularly for women, your wellness visits while you’re pregnant and wellness visits for your children are paid for. People are realizing the benefits of the ACA and now they are realizing that we can extend it further, and get to real parity for everybody. Medicare for all is the ideal situation. But for now we have to make incremental steps. First we have to stop the replacement. Then it’s start electing Democrats and Republicans who are for the ACA to make sure they protect it and make it better.